Ideal for retail environments that are looking for a safer alternative to A-Frame ladders. Imagine a ladder that is specifically designed to allow for easy and safe access to restricted spaced areas. Imagine a ladder that can replace the A-frame ladder. Ballymore presents the "The Navigator"
The Navigator has the combination of All-Directional Design plus a small, thin base which allows an associate to easily maneuver around tight corners or aisleways and not disrupt operations or customers. Its slick and thin design should not be confused with strength as the Navigator comes with heavy duty framing with a 450 pound capacity. As an added feature Ballymore has included our patented Weight Actuated Lock Step. There is no other kind in the industry. 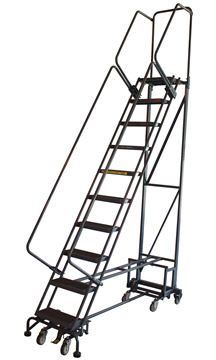 Essentially the Weight Actuated Lock Step prohibits the use of the ladder while still in the rolling position. Our engineers have developed a unique design that locks the ladder in place by stepping on any of the 10 Navigator steps. The days of "walking" the ladder are over! Are you still concerned about Safety and minimizing accidents? You will notice employees moving in and out of tight aisle ways with little effort. Stocking and De-Stocking will not disrupt operations and customers. The ladder will be used all throughout the operation as it is easy to push, steer and turn. The Navigator will ease your elevation safety and accident concerns so you can spend time addressing other areas. The Navigator – Its new, it's safe and it revolutionizes ladder and merchandise accessibility.